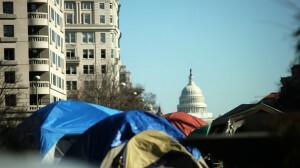 WASHINGTON, USA, 5.2.2012 – Police removed bedding and most tents on Saturday at an “Occupy” protest site just blocks from the White House, enforcing a no-camping rule at a public square that has housed protesters for months. 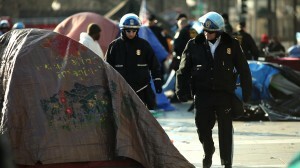 Dozens of officers sealed off McPherson Square and moved in before dawn to enforce the no-camping regulation. Demonstrators have been in the square since early October to target the growing income gap, corporate greed and what they see as an unfair tax structure favouring the richest Americans. By midday, police said there had been six arrests, but little to no violence. The National Park Service had repeatedly warned protesters that it would start enforcing a ban against camping in McPherson Square and at Freedom Plaza, both a few blocks from the White House. Police initially targeted a tarpaulin decorated with stars and moons draped over the statue of Civil War Major General James McPherson. Protesters had been gathering under the tarp at night. Police and sanitation workers removed tents, bedding and trash from near the statue. They then spread out in the square to clear other areas, making huge heaps of four months worth of debris. 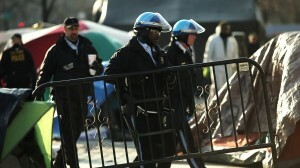 Similar “Occupy” protests against social and economic inequality in other U.S. cities have been shut down by police. 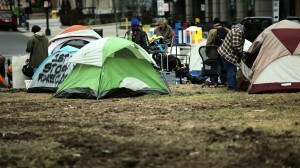 Local media in Austin, Texas, reported that police had cleared an Occupy encampment there, with seven arrests. A spokesman for the Austin Police Department was not immediately available to comment. Demonstrations in the U.S. capital have survived an unusually warm winter and a permissive approach by federal authorities reluctant to provoke confrontation. But the site has drawn increasing complaints from members of Congress and city officials because of squalor and rats. The protest site also had drawn numbers of homeless people. Tagged as: "Occupy Wall Street" Washington DC "Liberty Plaza" "McPherson Park" Eviction "Police brutality" Rafavideoart "New Nationalism USA" "American Spring" "anti capitalista"